This video is called What’s Wrong With Adwords? and brought to you by ethicalmarketingservice.co.uk. If you’re interested in Adwords management, please feel free to contact us. I have massive respect for Google and what they have created and this video has only been created due to recent innovations Google have implemented. And what I mean by that is, I think a lot of the changes which have been added to Adwords recently has been based on user feedback, or perhaps if not that, then just, you know, constant and never-ending improvement to the platform. And this is, or it can be like a wish list for what other things can be added next. So, I’m gonna kick it off with a negative SQR, there is no reason why this information should not be made available. Any negatives that have blocked an ad appearing, what was the search term for that block? This will likely help find new keywords that can be added and be confirmation you are blocking unappealing searches. So, the idea is, it works the same as the SQR, you would see all of the phrases, but instead of being phrases which someone had clicked on, it would be phrases that have been blocked from the ad appearing. So, I would think that this would be fairly easy to implement and I think it would be a good feature to add to Adwords. Next would be client friendly reporting. Google have been working on this with the new “reports” link at the top of the interface, but it is far from being what it could be. What I mean by that is, if you were to say what’s the absolute best that the reporting, what’s the best reporting we could get from this in terms of like, a download of all various, KPIs. It’s still got a little ways to go until it gets to that particular, until it becomes as good as it can be. Google have also introduced Google Data Studio which does show promise in terms of its presentation. But it’s still in its early days and I also think there’s not really a reason why it can’t be within Adwords itself. And, you know, there are other service providers which charge a fee for reporting on Adwords metrics and there’s absolutely no reason why Google can’t add this into Adwords. Next would be the Ad builder. Google have restricted the number of templates available in the ad builder and introduced “Google web designer” for the creation of HTML 5 ads. But every time a small business needs image ads, it’s normally at cost to them and there is no need for this when this feature could be improved. I think it’s highly possible for Google to have an ad builder which has loads of templates, and you know, it gives you the ability to tweak and create the ads. And I think I you were to say, you know, what’s the best we can make Adwords, then I think that that would be in there. Normal search campaigns are great for knowing if your ad is showing, with the ad preview, and if so, whereabouts. Shopping is almost the opposite, you only know if it is showing, or if your ad is showing, once it starts getting impressions or if you check yourself and this seems to take some time from launch. So, if you create a shopping campaign, it would take a couple of days for the ads to show. Average position is also not reported in the interface. So, I think it comes up as average position 0.0 or something like that. I just mean in terms of how it compares to normal search campaigns. Shopping is pretty far behind and I think we have just, sort of accepted that that’s the case. But I think Google shopping has become a fairly large part of Adwords activity and I think we should be able to see some transparency there. Whenever I have an issue with Adwords and call the help desk, like an error or something and I get through to Ireland, the problem is almost always solved quickly. When I get transferred to the world-wide help desk, I get an answer, I believe, about half of the time. And if Google is to be an example for other businesses, I think that this should be addressed. I think some companies are actually going the reverse of outsourcing call centers and that kind of thing and making them local. And I think in an ideal world, local call centers would be desirable. The click-through rate is obviously a part of quality score and if they were to release the expected click-through rate as a number, a percentage, or an approximate for each keyword, it would be something to work towards or another metric for improvement. This would also show if you were significantly below standard. If an expected click-through rate for a particular ad position or an average position would be, let’s say, five percent, they would expect you to hit five percent and if you were at 0.5 percent. Then you would think, I really need to make some changes on that. Whereas at the moment, I think all you see is either above average, as per the screenshot, or below average. And I think it would be a lot, better in terms of, it would sort of prove that you need to make some changes to improve that. And lastly, what are your ideas? Please post your comments below. If you know anyone who works for Google, involved with these types of decisions, please share the video and hopefully we can improve Adwords together. I think that it’s going to be better than just a few ideas from me. If you post them below and if you liked the video, please rate and subscribe. 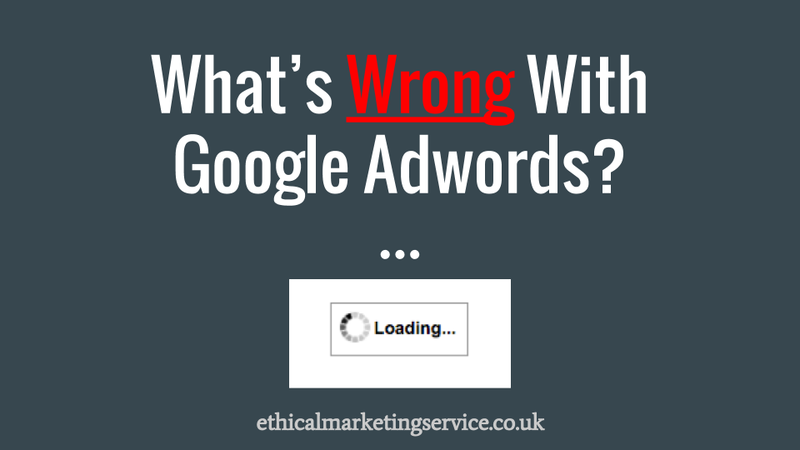 And again, if you are looking for Adwords management, you can visit us at ethicalmarketingservice.co.uk. This entry was posted in adwords and tagged What's Wrong With Adwords?. Bookmark the permalink.